Christmas is so popular it has its own decorations, its own music, and even its own drinks. When it comes to sampling delicious and rare beverages, the holidays are a great opportunity. 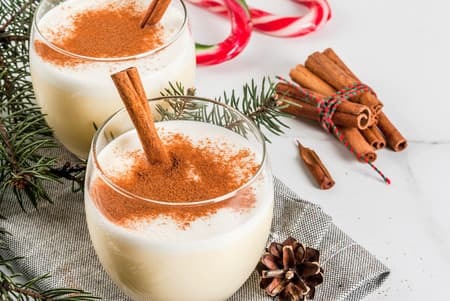 Drink shops serve up these tasty treats exclusively around the holiday season, and you can add them to your table by buying them or making them at home. 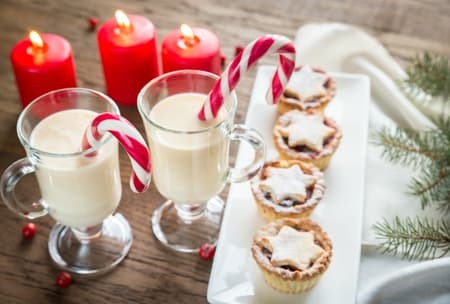 Many people cook Christmas dinners and make holiday-themed desserts. 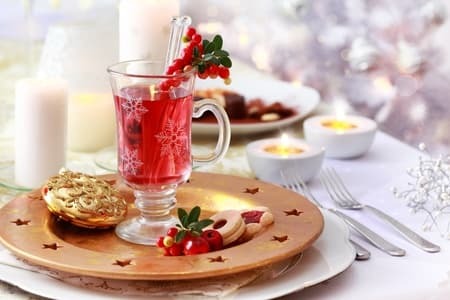 You can do the same with drinks – check out these recipes and complete your Christmas table with some tasty winter drinks. For this one, gather up an orange slice, a half-cup of cranberries, a half-cup of pomegranate seeds, two cups each of cranberry and orange juice, and a cup of pomegranate juice. Just mix these up over in a bowl with ice and some Rosemary for garnish. You can even mix in a little alcohol to give your punch some extra punch. Add these ingredients, in this order, to a shaker: six ounces of almond milk, four ounces of Frangelico liquor, and two ounces of cake vodka. Add ice, shake, pour into glasses, then top with whipped cream and grated nutmeg. Mix two ounces of strawberry vodka, two ounces of cranberry juice, and four dashes of white crème de menthe in a cocktail shaker. Strain into glasses that have had their rims coated by crushed candy cane. You can turn the glasses upside down and rotate them to coat the edges. Set aside some champagne flutes and an orange slice dipped in sugar. Mix a cup of orange juice with a tablespoon of heavy cream, then pour into the flutes and top with champagne. Garnish with the orange wedge to create a tasty treat. This variation on an old classic requires you to heat four ounces of eggnog then add some spiced rum and a bit of salt. Pour into a mug coated with caramel sauce, add whipped cream, and toss on some toffee bits, nutmeg, and sea salt for good measure. Combine a cup of vodka, a cup of champagne, a half cup of blue curacao, and a half cup of lemonade in a blender with ice. Rim glass with a lemon wedge and sanding sugar, then pour the frosties in and serve. Combine two ounces of cranberry juice and two ounces of vodka in an ice-filled glass. 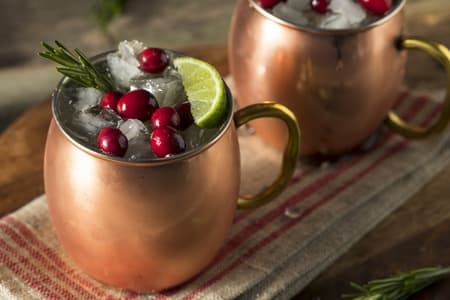 Add some cranberries, three ounces of ginger beer, and garnish with a lime wedge for a tasty and relaxing addition to your Christmas table. Add five pomegranate seeds to a champagne flute, and then add an ounce of pomegranate liquor and four ounces of sparking wine. You’ve got a smooth treat that fits with the theme of the holidays. For this one, you’ll need a cocktail shaker full of ice. 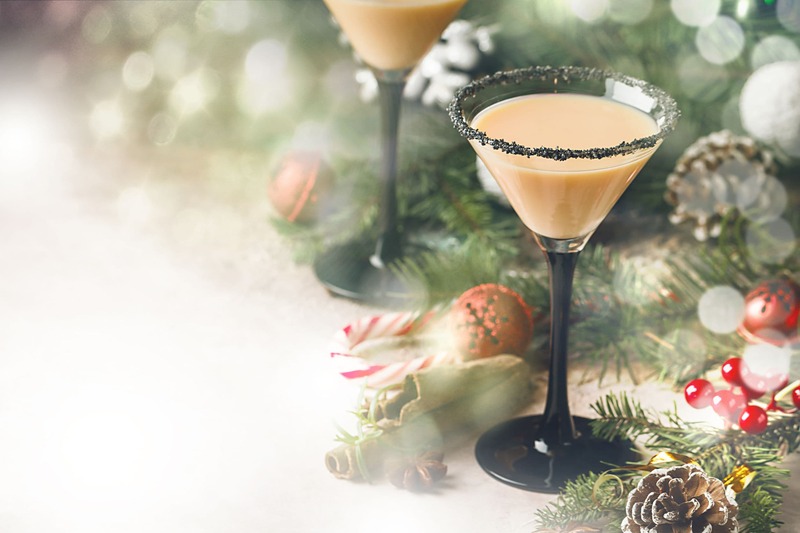 Pour in a fluid ounce of heavy cream, a fluid ounce of peppermint schnapps, and a fluid ounce of vodka. 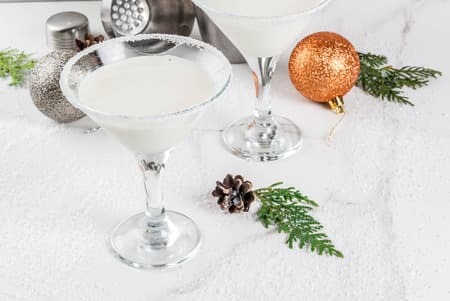 Cover and shake, and when the outside of the shaker has frosted you strain it into a chilled glass, add a mini candy-cane and serve. Pour three cups of sparking cider, three cups of pear juice, and one-half vanilla bean with some cloves into a saucepan over medium-high heat. Simmer for seven minutes, remove the heat, and stir in a half-cup of brandy. Strain into a heat-proof container and pour into mugs, toping off with some more cider and a garnishing with a pear slice. Combine one-and-a-half ounces each of vanilla vodka and cranberry juice into a cocktail shaker with ice. Shake and strain into a champagne flute, add to a glass of sparkling wine and garnish if you prefer. Beat three cups of cream and three tablespoons of sugar until soft peaks appear. 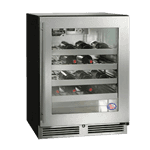 Refrigerate, then add two tablespoons of whiskey to heated wineglasses. Stir four tablespoons of sugar into coffee, then add the cream and sprinkle with nutmeg if desired.